WHAT IS IT? 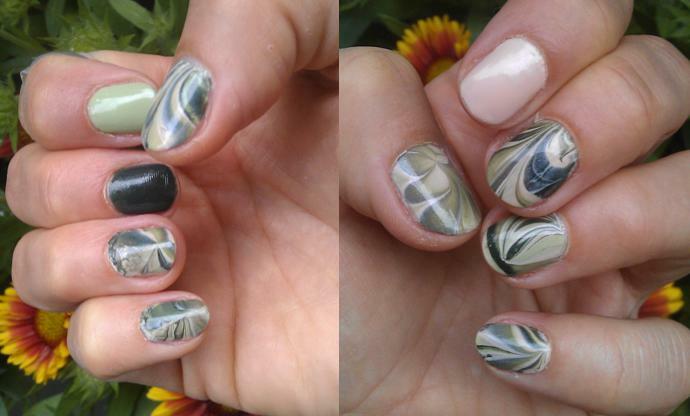 Water marbled nails in dark green, light green and a pale rose and three nails that just wouldn’t take the water marbeling and that sport the three colours I used as singles instead. WHAT IS USED? I watched many water marbleing tutorials before I started. The effect of making nail polish spread in a glass of water worked out ok with these three colours: essence, 139 walk on the wild side (a dark pine green with glitter) and 04 rosewood hook from the Wild Craft edition (a pale shimmering ros) as well as essie, Limited Edition navigate her, 207A, navigate her (a light spring green – my very first essie nail polish, by the way). I didn’t use any special pattern for the marbleing. It was more trial and error. I had done a test run of about three nails before but except from that these were my first water marbles. The first two nails went well, the next three went progressively worse. Then I detected a huge nail polish bubble on my left index finger, the next two fingers worked but looked kind of ugly and when on my middle and index finger on the right hand my water marbleing didn’t work out either I took off the nail polish there too. And finally, frustrated I decided against giving it more tries to water marble these remaining fingers and painted them in the base colours instead. HOW DOES IT FEEL? Well the fingers where it worked out are kind of cool (still not sure if this was the perfect colour combination). But there were far more fingers where it didn’t work out well. Some marbles got too dry in the water already and couldn’t be used at all. So the amount of polish you waste ist not worth the effect, I think. 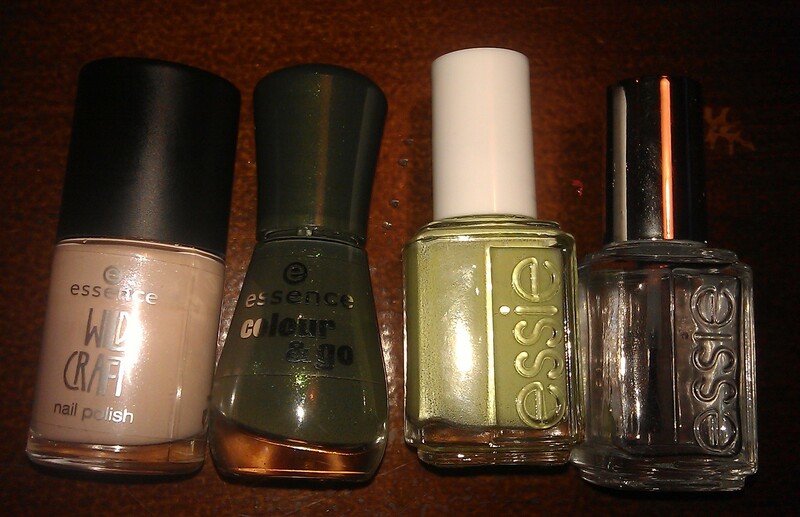 I might give it another go if I have nail polishes that I want to use up but otherwise no. Plus it is a bit exhausting to cover the whole finger in tape so that you don’t have to clean up so much afterwards, doing one finger at a time. This entry was posted in Nail Art and tagged 31 day nail challenge, essence, essie, navigate her, rosewood hood, walk on the wild side, Water Marbles Nails by kathatravelling. Bookmark the permalink.